Located in Bacolod, Planta Centro Bacolod Hotel & Residences is a 1-minute drive from Gaisano City Mall and 8 minutes from SM City Bacolod Northwing. Featured amenities include a business center, complimentary newspapers in the lobby, and dry cleaning/laundry services. A roundtrip airport shuttle is provided for a surcharge during limited hours, and free self parking is available onsite. When you stay at Casa Rosa Taytay in Taytay, you'll be within a 10-minute drive of Sta. Monica Parish and Taytay Port. Free self parking is available onsite. 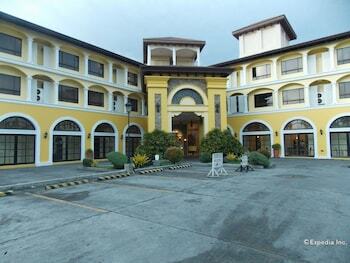 Located in Baguio, La Casa Bianca is within a 15-minute walk of Teachers Camp and SM City Baguio. Free self parking is available onsite. When you stay at Bale Mi Resort in Boracay Island, you'll be near the beach, within a 15-minute walk of Boat Station 2 and Boat Station 1. The front desk is staffed during limited hours.